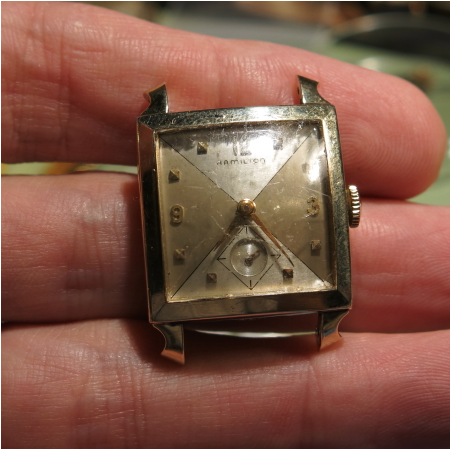 I've got one more micro-mens watch to show you but I'm waiting on a new crystal for it. So in the meantime I'll share with you a recent overhaul instead. 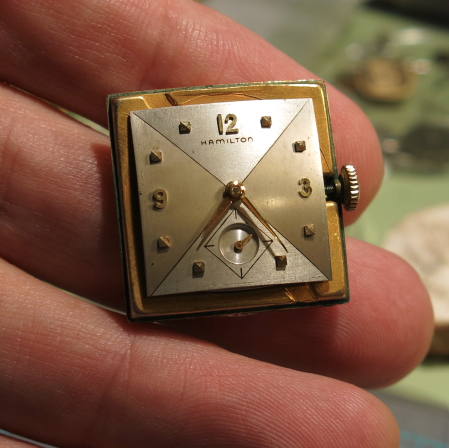 In the early 1950's Hamilton replaced it's 14/0 movements (the 980, 982 and 982M) with slightly larger 12/0 sized movements. The 17 jewel 980 was replaced by the 17 jewel 752. The 19 jewel 982 was replaced by the 19 jewel 753. 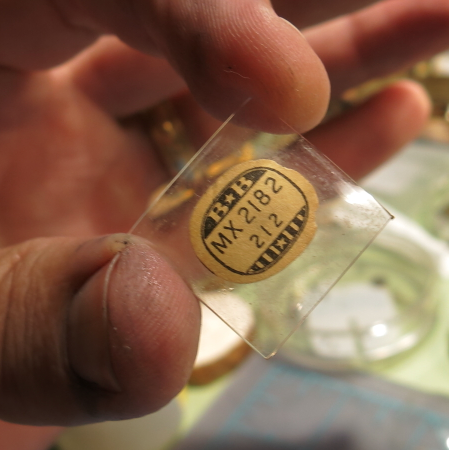 The 982M medallion movement that was used in solid gold watches was replaced by the 19 jewel 754 -which was also a medallion movement. The 754 is identical to the 753, except it is finished with finer details and is "prettier". 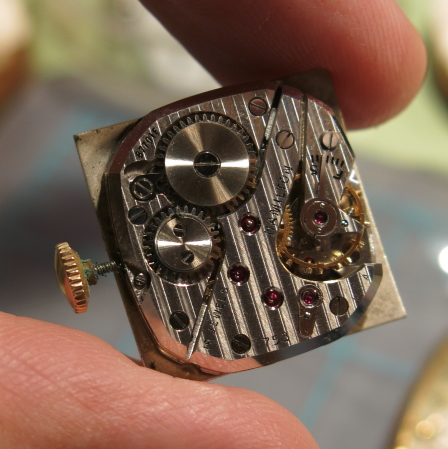 Oddly enough, by 1955 they were all replaced again by the 22 jewel 770 movement - which is also 12/0 sized and a drop in replacement. 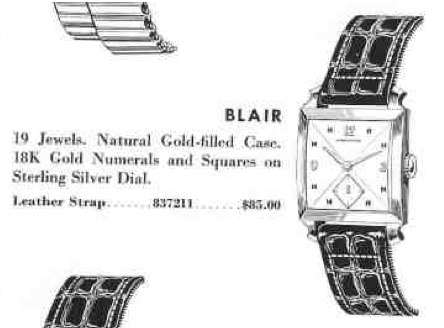 In 1954 Hamilton introduced the Blair. It was produced through 1958 so you'll find it with the 19 jewel 753 as well as the 770 - but the 753 is less common since it was only used for the first year. The Blair comes in a 10K gold filled case. 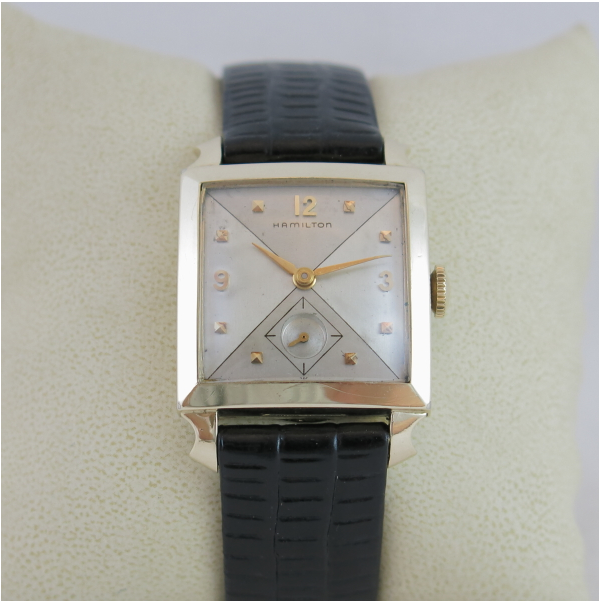 It has a sterling silver dial that is finished with an interesting two-tone design and features solid 18K gold numerals and squares. 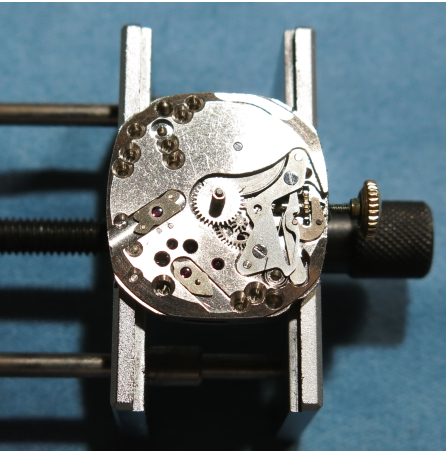 I recently picked up a Blair project watch and since it's been a while since I've shown you what an overhaul entails, I'll give you a pretty close step-by-step description. 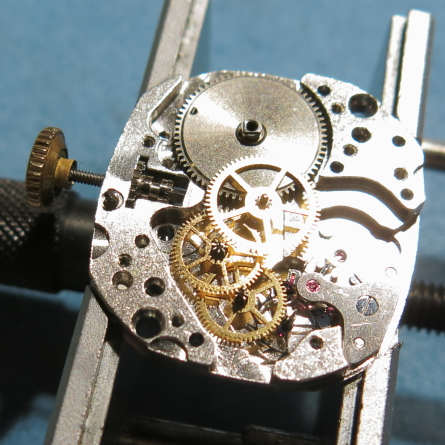 Plus, it's a 753 movement - which I don't think I've show cased before. As received, it was considerably beat up and in need of love. The crystal was so scratched, it was hard to tell what was going on beneath it. 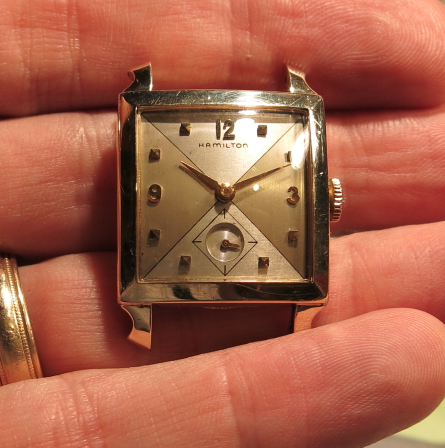 Turns out, the dial and hands were in excellent condition. If you look closely at the picture above, you may note the two grooves in the case back at the 5 and 11 positions. These are the two locations where there is a slight lip on the movement. 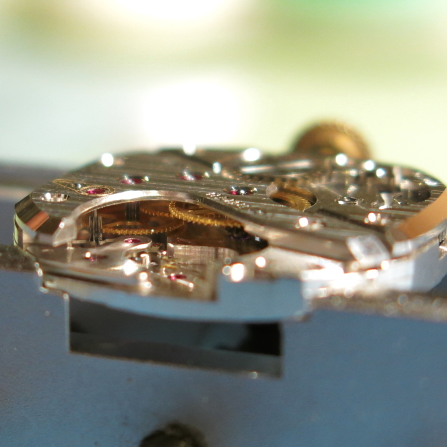 You simply slide a screwdriver into the slots and gently pry the movement up and out of the case back. A lot of folks will try to push the movement out using the crown - but that just risks bending the stem. So try to refrain from doing that - as it's very tempting. 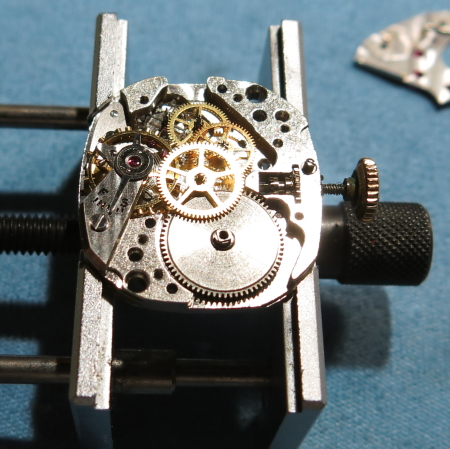 With the dial and movement out of the case, you can see this is a 753 movement - although the engraving is a little hard to make out with all the decorative damascening. 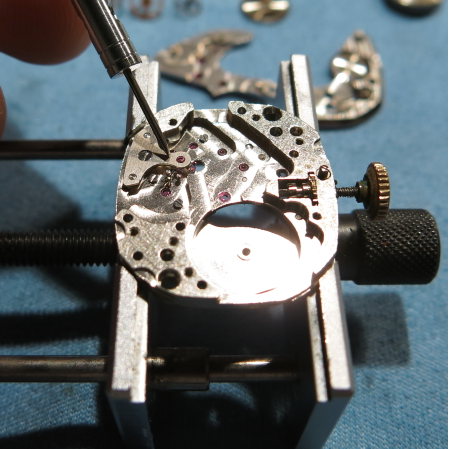 Next, the hands are removed using "hand pullers" and the two dial foot screws on the side of the movement are loosened. This allows the dial to come off and the second hand comes with it. With the dial removed you get to see the dial-side of the main plate. Directly in the center is the hour wheel (drives the hour hand) and the cannon pinion inside of it - that drives the minute hand. Tucked just to the below right of the hour wheel is the minute wheel. The cannon pinion turns the outer diameter of the minute wheel and the inside of the minute wheel turns the hour wheel - and that's how the two hands stay in sync. The hour wheel and cannon pinion come off now. 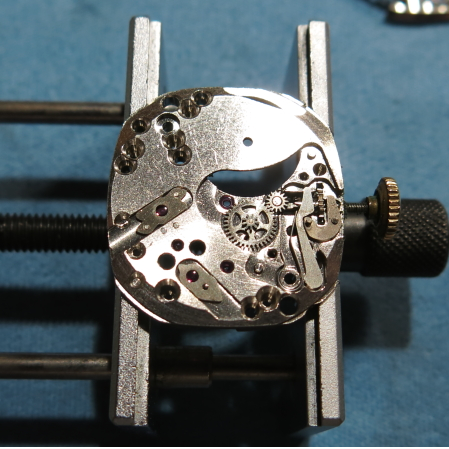 With the cannon pinion removed, the movement is flipped over to the back side. My screw driver below is pointing to the "click". The click has a little spring that keeps the click against the ratchet wheel next to it. That's what you hear clicking when you wind the watch. Underneath the ratchet wheel is the mainspring barrel - that's what stores the energy when you wind it. The screw in the center of the ratchet wheel connects the two parts together. You need to release the mainspring energy before going any further - or it will release on you when you take the ratchet wheel off and possibly damage something. 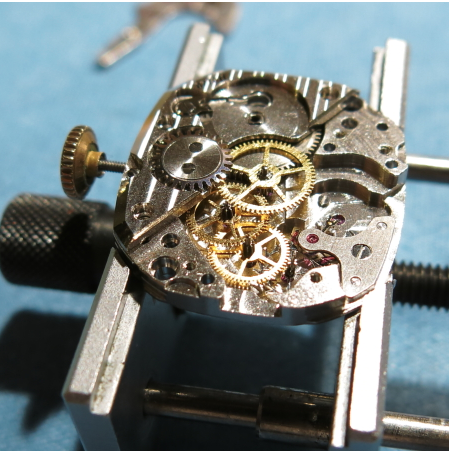 To release the energy, you turn the crown to wind the watch and then hold the click open with the screwdriver. Then you let the crown slowly freewheel backwards and "unwind". The ratchet wheel and barrel bridge come off next - and expose the mainspring barrel below along with a portion of the center wheel. The barrel is technically the "first" wheel. It drives the center wheel which is technically the "second wheel". The cannon pinion is attached to the center wheel arbor (shaft) on the other side of the movement. That's why I had to take it off first - otherwise I wouldn't be able to take the center wheel out. Three screws hold the "train bridge" on and with them removed the bridge just lifts right off - and exposes all the wheels. Now you can see the mainspring barrel, the center wheel, the "third wheel", the "fourth wheel" (which the second hand attaches to) and finally the silver-colored "escape wheel". They can all come out now along with the balance assembly - which is still held in place with one screw on the left. Now my screw driver is pointing to the pallet fork and the bridge that holds it in place. 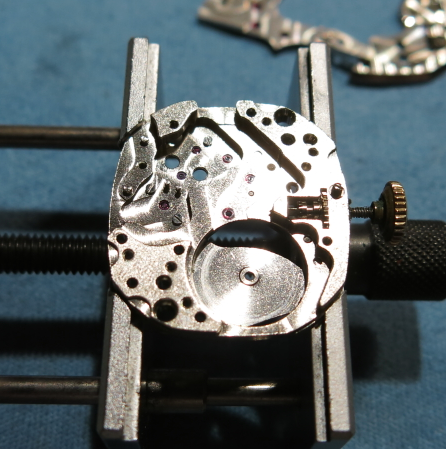 One screw holds it together and once that's out the back of the movement will be completely cleared of parts. Oops, I lied. 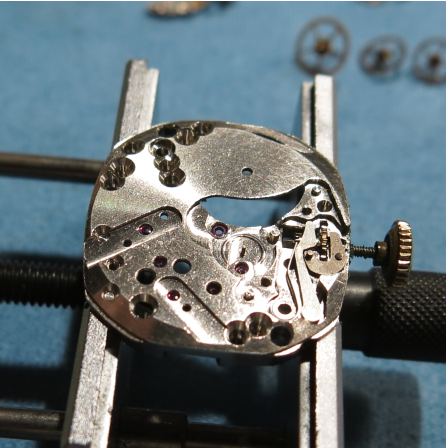 There are still three parts remaining on the back - they are three tiny screws that hold the cap jewels on the front of the movement in place. More on that in a bit but first they have to come out. 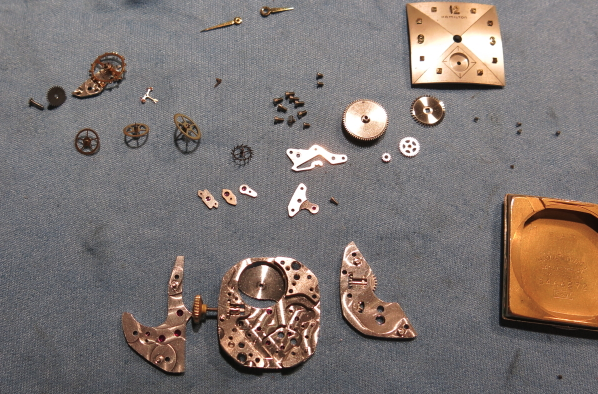 By comparison with the above, you can now see the front of the movement is cleared of parts. I usually leave the set lever, stem, clutch wheel, etc. in place. They will get cleaned when I clean the rest of the parts. 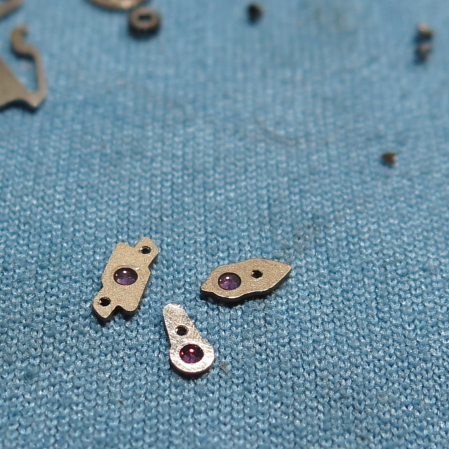 Here's a shot of the three cap jewels that get removed. One of them covers the balance staff, and the other two cover the two ends of the escape wheel. 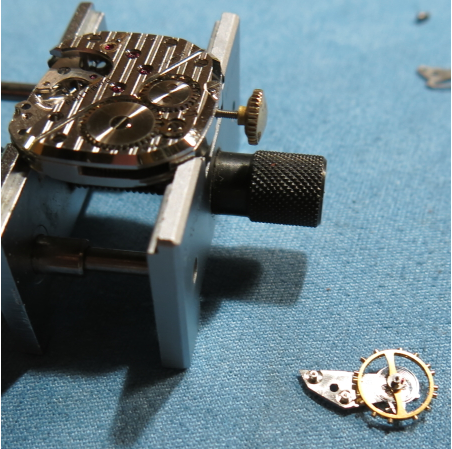 The balance staff and escape wheel do the most moving when the watch is running, followed closely by the fourth wheel. That's why they usually get cap jewels - to keep crud from getting caught in the jewels. 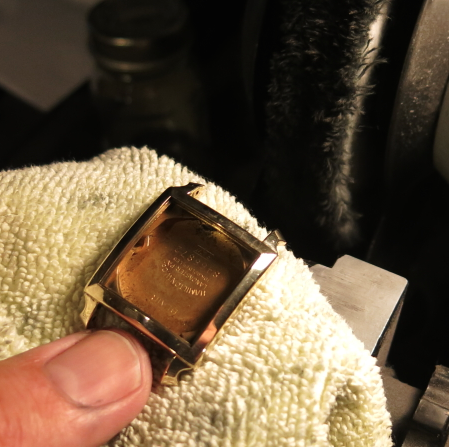 While everything is in the ultrasonic, I turn my attention to the case and give it a light polish. I've got a new old stock crystal to install in the case. If you've ever wondered about how that's done, check it out here. Well, everything is cleaned and dried and it goes back together pretty much in the opposite way that I took it apart - although I like to put the balance on last. 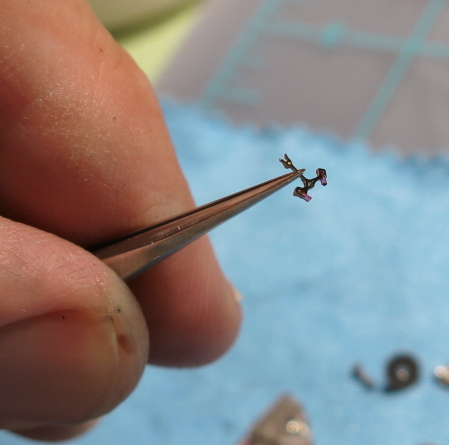 All of the jewels get a tiny droplet of oil. 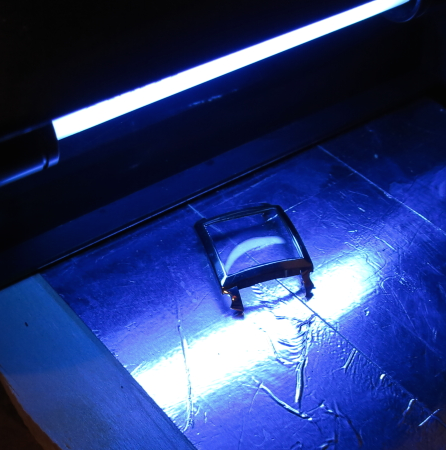 While I'm reassembling the watch movement, the new crystal that was installed in the bezel is placed under a UV lamp so the glue will cure. 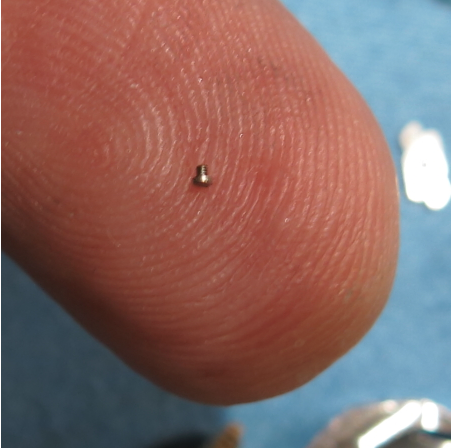 The first thing to go back in is the cap jewels and believe me, you don't want to lose one of these tiny screws. As you can see below how small they are based on my finger tip. Here's a shot of the pallet fork, sometimes called an anchor - for obvious reasons. You can also see the two pallet jewels sticking down. Those count as two of the 19 jewels in the movement. They are specially shaped to engage the escape wheel and they are held in place with shellac. That's why you never clean a movement with alcohol - as it dissolves shellac. With the pallet fork back in position and secured by it's bridge, all the wheels go back in at the same time. The 12/0 sized movements have a four-wheel train bridge so it can be a little tricky to get them all to line up properly. To aid in reassembly, I put the barrel bridge back in place first. I can use that to guide the train bridge next. If all the wheels are lined up correctly, the train bridge will simply drop in place. Normally some tweaking is required to get one of the wheels into position and this is the angle by which you can see which wheel(s) to adjust. In this shot, everything is lined up and the train bridge is in place. All the screws go back in and the ratchet wheel is reinstalled. So now I can wind the watch up a little and put some energy back into the gear train. Next the balance assembly gets oiled and put back in place. If everything is good to go the watch will start right up and do it's thing. If it doesn't start... well that means something is not right. Fortunately, this time everything started right up. 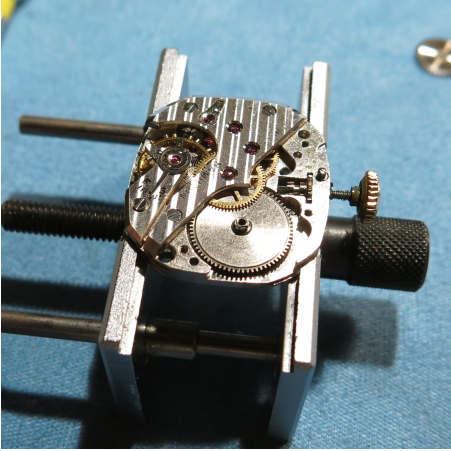 After a little tweaking, this movement is purring like a kitten. Runs pretty much spot on with great amplitude and minimal beat error. 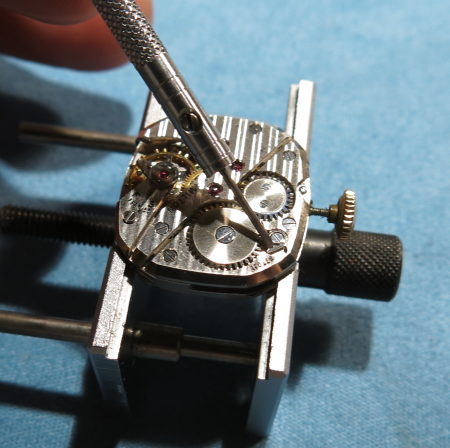 And finally the dial and hands get reinstalled and everything goes back into the case. And here it is presented below with a black croco-lizard strap. 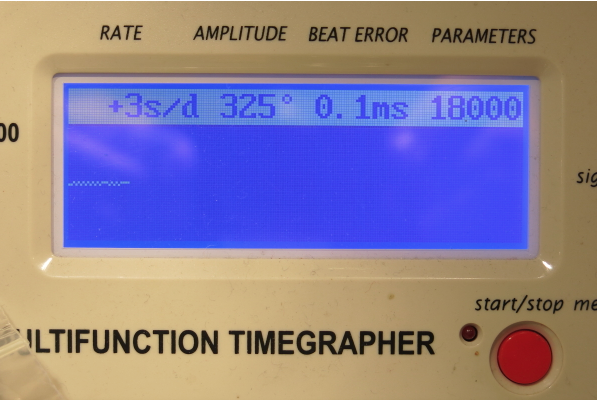 Notice how the two tone dial changes tones depending upon the lighting versus the picture above. This is a tricky dial to photograph. I think the watch really turned out great. Thanks for posting this. I have this watch as well. It was my half-brother's and while I would not be able to go into the detail striping and re-assembling that you did, it prompted me to clean up as best I could and put it back into occasional use. As you say, the two-tone face is rather classy. This is my favorite Hamilton. What a great dial design. Very cool...thanks for sharing! I have owned one for nearly 30 years and I refuse to part with...such a beautiful timepiece...love it! Thanks for sharing. I've owned the 1956 Blair for about 16 years now. Purchased @ Govberg's in Philly. Bought because it was made the year I was born. I'm the second owner and couldn't happier with it. Its my favorite watch. It dosen't take a lickin' so it keeps on tickin'....Recently had it cleaned and serviced.....runs like a top.